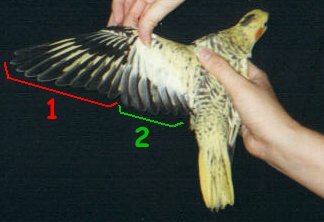 Proper wing clipping is essential for pet birds. Birds kept in aviaries with saftey porches are the only ones who should be allowed free flight. Too many flighted birds escape, crash into windows, fly into ceiling fans and open water containers, etc. Some people claim to have "bird-proofed" their home enough to allow free-flight, but there could still be many unforseen dangers. If you do not live alone, you also have to rely on other people to close doors and windows and keep them closed then a flighted bird is out. One small miscommunication could lead to an escaped bird. In addition, free-flight causes some birds to become territorial and hard to handle. Birds do not molt all their feathers at once. They can't- in the wild they still need to be able to forage for food and escape from predators. Instead, they lose one or two feahters at a time in alteration. Since most birds (especially the smaller ones) can fly with only one or two primary feathers, it is important that you clip each individual feather after it's grown back. Don't wait until ALL the primaries have grown back before taking your bird to be clipped. This leads me to another point- many people seem afraid/unwilling to clip their own birds. It's a simple procedure that anyone can (and should) learn. Some people are afraid their birds won't like them if they do the clipping themselves. This is nonsense. I've been clipping all my own birds for over a decade; no one holds a grudge. The scissors are the bad guy. ;) As long as clipping is done quickly and painlessly (don't cut bloodfeathers) birds will forget about it five minutes later. Unless your bird is very good about you touching it's wings (some people train their birds to raise their wings for clipping), you may need to towel it. Use a thin shirt for smaller species. Small birds can be held in one hand and clipped with the other. With larger birds an assistant is needed. One person should hold and the other should cut. The feathers that need to be clipped are the primaries, or flight feathers (1). These are what provides the power for flight. In small birds 7-10 feathers should be cut because these guys can get lift very easily. Large species often fall like rocks when only a few are cut. Two - 5 is standard for larger guys. Never cut too far up (see red line). There should still be some space (at least a cm) between the edge of the cut primaries and the feathers above. Feathers are easier to clip than nails because it's easy to recognize a blood feather and much harder to find the vein in a nail. Some people buy cement or sandpaper perches in an attempt to keep nails trimmed. These can actually irritate birdy feet so forget about them. The best perches are those of varying width and texture, like natural wood or Booda rope perches. Learn to judge on your own. If your bird is tripping, the nails are catching on your clothing or pricking your skin, it's time. Some birds don't even need to be restrained for nail clipping. With both my GC conure and my tiel, I can let them sit on my finger while I just reach over and snip. You have to be careful with this though since they can move. Have you seen those nail clippers sold in pet shops for clipping rabbit toes and such? The ones that have a circular opening for the nail? Don't buy those. They really stink. I use human fingernail clippers (birds get kinda scared of the sight of these) or nosehair clippers (I know, gross, but the birds aren't very scared of them). Get out a towel (or old thin t-shirt for smaller birds) and some flour (in case of bleeding). Kwik-stop isn't recommended. There are some bad stories floating around that it can be toxic or painful, and flour works better anyway. With small birds that don't bite very hard you can usually do the job yourself. With major bitters or larger birds it's better if you have two people. One person should towel the bird and keep the beak out of the way while the other person holds the feet and clips. This should all be done as quickly as possible to minimize stress. In black nails the vein can be virtually impossible to detect. If you're experienced you can avoid it by just using your intuition. Beginners can try pressing down slightly with the clippers first and if the bird flinches, chances are there's the vein. Some birds squeal or flinch at any pressure though, with or without a vein. Not all cut veins bleed right away so keep an eye on the bird for a minute or two after cutting. Most veins start dripping once the bird begins walking around. Flour stops bleeding pretty good but you may have to hold the bird still for a few minutes to keep the flour from being rubbed off. Under no normal circumstances does the beak have to be groomed. Unfortunately, there has been a bit of hype about grooming beaks lately, mostly to try and sell beak sanding tools. Only birds with grossly deformed beaks need any grooming. Scaley mites, injuries and vitamin deficiencies can cause the beak to overgrow. In a case like this the bird should be taken to a vet to have the beak done professionally.